"EASY HEALTH" our name justifies our motto; we want everyone in our nation to go Healthy using some simple and Easy methodologies. If you want to get fit and don't have time to get into a gym then don't worry EASY HEALTH is here to help you get fit as we are serving fitness to our customers from a long time. Our products will help you get a fitter, healthier and nimbler body!!! 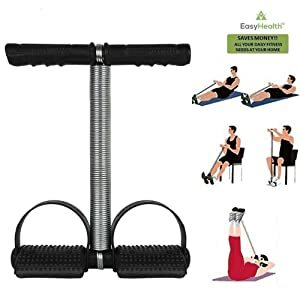 If you always wanted trim and strengthen your arms, legs, hips and thighs, use the EASY HEALTH-TUMMY TRIMMER, any place, anytime, in the office, at home, watching TV. It is portable, compact and can fit right into your briefcase. Our product has High Tension Double Tube System for men and Low Tension Single Tube System for women. 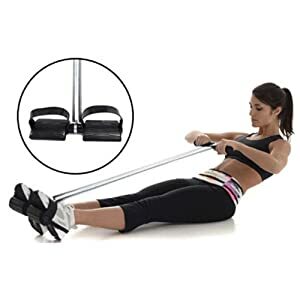 Contoured feet pedals with Rubber tube pull up bar which is portable and lightweight can be used anywhere anytime. There are multitudes of benefits of using EASY HEALTH-TUMMY TRIMMER. One of the most important benefits is Back Support. Victims of back and spine trauma are often instructed to wear waist trimmers and compression bandages around the waist to support their backs and create the best posture for healing. Compression is part of the physiotherapy portion of the recovery, so it could be hypothesized that wearing a waist trimmer can be beneficial to those with bad backs, poor posture and pain at the end of the work day. If you have lower back issues, a waist trimmer may give you the extra support you need to sit up straight and remove some of the pressure on your back.